I agree about the potential lineup on WB 404 to turn onto WB 50. The sooner an interchange at 50 and 404 can be made shovel ready through funding, design, and land procurement, the better. I'm sure I'm not alone when I think sometimes about cost overruns for public works. Was the 404 dualization done on budget? Of course it wasn't on a par in scope with the Big Dig. I poked around for an answer to your question last November, but didn't find much of anything. I believe most of the land was already owned by the state; pre-project most of the utility poles were well back of the roadway. The project was divided among 3 contractors, and it was (mostly) finished by the originally established deadline. The old lanes, now the EB lanes, do still need a final layer of asphalt. There was a similar BUSINESS MD-3 sign on I-97 northbound north of Benfield Boulevard. It went away after a few months for reasons not clear to me. The green on white seems to be standard for Maryland. Every business route I can think of (US or state) has that color scheme. As far as 404, I was on the dualized section in January when I got Caroline County. Even in the winter, the passing lane was warranted. QUEEN ANNE — The Maryland Department of Transportation State Highway Administration’s MD 404 highway widening project, featuring an innovative partnership with industry partners and completed on-time and budget in only 18 months, has been recognized with an America’s Transportation Award. Sponsored by the American Association of State Highway and Transportation Officials, Socrata, AAA, and the U.S. Chamber of Commerce, the 11th annual America’s Transportation Awards competition selected the $158 million MD 404 (Shore Highway) project as the best in the northeastern states in the Quality of Life/ Community Development Category for medium projects (costing between $25 million to $200 million). The award lauds MD 404 project’s safety enhancements for residents and seasonal motorists, as well as overall improved operations and congestion relief. MD 404 carries 18,000 vehicles per day, a number that increases by 25 percent in the summer. Historically, MD 404 also posted vehicle collision rates higher than the state average, with 402 crashes and 12 fatalities between 2005 and 2014. To improve safety on a roughly 10-mile stretch of MD 404, this $158 million project took a two-lane road and widened it to a four-lane divided highway, with a 34-foot median and 10-foot-wide shoulders. Answering Governor Hogan’s landmark challenge to improve safety, reduce congestion, and improve MD 404 across three counties by Thanksgiving 2017, MDOT SHA opened the four-lane divided highway with median and shoulders as promised. The 11.3 mile dualized MD 404 provides a direct route between US 50 and the Town of Denton, enhancing safety and operations for residents and reducing traffic congestion caused by high season peaks associated with summer resort traffic. With extensive outreach to the community, construction began in summer 2016 with an expedited design-build contract and innovative partnership with industry partners — shortening the standard construction timetable by 18 months. In the end, the MD 404 project made the road safer for all drivers, especially providing more peace of mind during the busier summer months, the award statement said. The America’s Transportation Award competition will continue throughout the summer. MD 404 could be included as a “Top 12” finalist, which will compete for the Grand Prize, selected by an independent panel of industry judges, and the Socrata People’s Choice Award, chosen by the public through online voting. The top two winners also receive $10,000 cash awards, to be donated to a charity or scholarship of the state DOT’s choosing. Online voting begins Aug. 30. The winners of the top two awards will be announced Sept. 23, at the AASHTO Annual Meeting in Atlanta. Got to finally drive across the newly widened MD-404 on my family's trip to Bethany Beach recently. What an improvement! So happy this project is done, as it will make going to the beach far more enjoyable and more importantly safer. 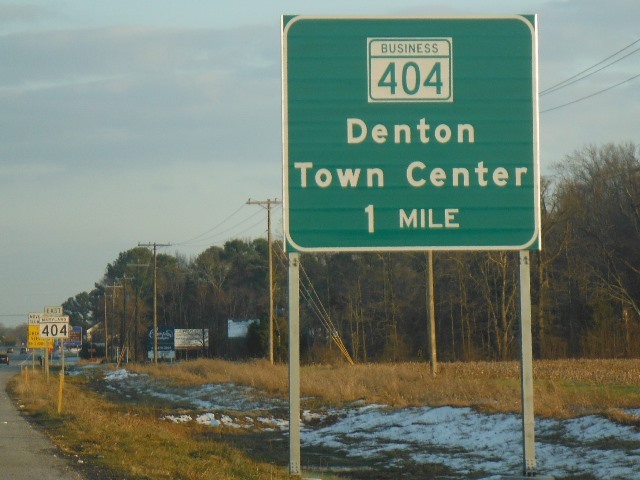 Further widening to the Delaware State line may be needed eventually, but at least the worst part(US-50 to Denton) is now a thing of the past. I have driven it several times, and it is a great improvement. It has nonlimited-access right-of-way, but the level of access management and the J-cut turns provides an expressway-like experience. My only negative comment would be the median width, given the amount of right-of-way bought in the 1960s when the relocated 2-lane highway was built, there was space provided for 4 lanes and a median at least 60 feet wide. A 34-foot median necessitates a guardrail median barrier and the dualized highway has that. However the dualized side has very wide ditches that seem to be stormwater management basins as well, and given the fairly level topography, that may be needed to provide proper drainage for the whole highway. So it appears that they used all of the future right-of-way on that side for the new roadway and the stormwater management basins. They were still working on the roadsides last time I drove it in May. I drove it today and all work looks complete. Google Maps now has it on satellite view, and the unusual series of storm water basins is visible. Very interesting, have not seen this design before. I also drove the MD-404 route from MD-16 to Delaware. Speed limit is 55, higher than most Maryland 2-lane highways. Good highway that looks usable for a dualization project. Some places may have 4-lane right-of-way based on where the utility poles are. Looks like a parallel roadway could be built on the north side without any buildings needing to be acquired. If they build the large storm water basins like on the previous project, that is another matter, they may need considerably more right-of-way width. Another reason why they built those basins may have been to capture the large amount of runoff from fertilizers and chemicals utilized on the large farms that are adjacent to the highway in many places between US-50 and Delaware.